Improve quality of life for seniors with Absolute Companion Care’s Butler home care services. Absolute Companion Care is pleased to provide the highest quality, most dependable home care services in Butler, MD. Our services are always personalized for each unique individual, and encompass a full range of options to fit any schedule and need, such as transportation, help with care needs at home, running errands, specialized Alzheimer’s and dementia care, and much more. 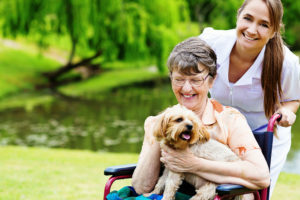 At Absolute Companion Care, our caregivers are extensively screened and background checked, and then provided with in-depth training to ensure they’re fully equipped to provide the very best care possible in private homes, assisted or independent living facilities, nursing homes, hospitals or rehab centers. Our Butler Home Care Services Are Simply the Best! Working with Absolute Companion Care ensures that you’re receiving the highest quality care possible for your senior loved one. We ourselves have been in need of care for our own loved ones at home, and we understand how challenging it can be to choose the best care solution. We’ve lived and worked alongside you in the Butler area for decades, and we hold to the most stringent requirements for each member of our caregiving team – providing families with the comfort of knowing they’ve chosen the right care partner for their senior loved ones. When a new caregiver comes into an older adult’s home for the first time, it naturally can lead to some unsettled feelings. But with Absolute Companion Care, any anxious feelings quickly dissolve, and a bond of trust and companionship develops. We help additionally with this process by ensuring each member of our caregiving team is fully screened, background checked, interviewed, and trained, so we know they’re qualified to meet a variety of aging care needs, such as preventing falls, caring for those with dementia and other chronic diseases, preparing meals, and so much more. We also take into consideration personality characteristics, interests, and disinterests when matching a caregiver to a senior, providing for the best possible connection between the two. We invite you to contact us to learn more about our Butler home care services and to allow us to share some additional helpful resources specific to the challenges your loved one is facing. Contact us online or call us any time at 410-357-9640 to request a free in-home consultation, and take the first step in improving quality of life for your senior loved one!